With 2010 projects totalling more than R80 million, Robor Pipe Systems is poised for a year filled with great success. Contributing to that success is the company’s continuous investment in research and development, and its up-to-date knowledge of South Africa’s increased need for infrastructure development within the complex limitations of our developing-world economy. Robor Pipe Systems’ newly acquired robotic welding arm operates at four times the speed of manual welding. A leading supplier of steel pipes and complete pipe systems, Robor Pipe Systems completed various projects in the first half of 2010, one of which was supplying a slurry line system. This involved the upgrading of a Steel Polypipe production facility to mass produce piping spools 12m long and 600NB in diameter, with the aim of improving throughput in order to meet tight customer requirements. An investment in a submerged arc and robotic welding equipment has expanded the company’s welding capabilities and enabled the speedy delivery of a recent shaft piping project with strict time constraints. The submerged arc welder facilitates a process by which metals are joined by an arc between a bare metal electrode and the work. Shielding is supplied by a granular, fusible material usually brought to the work from a flux hopper, while filler metal comes from the electrode and sometimes from a second filler rod. One of Robor Pipe Systems’ most exciting acquisitions, the robotic welding arm was commissioned early this year and is now fully operational at four times the speed of manual welding. The robotic welding arm is an extremely flexible alternative to traditional welding equipment and is perfectly suited to structural and conveyance welding for tube and pipe. Segmented bends have been used more than fabricated pool bends; however, the quality achieved through pool bends, which ensure there is no disruption of flow, is far preferred. 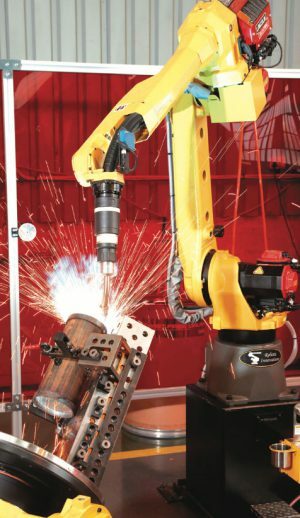 With rising labour costs and an increased need for higher-quality products, the robotic welding arm is the ideal solution. It can produce a fail-safe segmented bend at a superior quality standard to that in the past and ensures consistency, quality and speed, enhancing the company’s value-adding services.